The Nintendo Switch is king when it comes to gaming on the go, but it's tough to lose yourself in Zelda: Breath of the Wild or Skyrim if your battery dies out. That's where this Nintendo Switch Battery Charger Case comes into play. Built exclusively for Nintendo Switch, this pack allows for uninterrupted charging while you play, delivering 10,000mAh of power via an integrated USB-C PD port, and it's on sale in the Boing Boing Shop. In addition to doubling your Switch's battery life, this case protects your console inside and out. 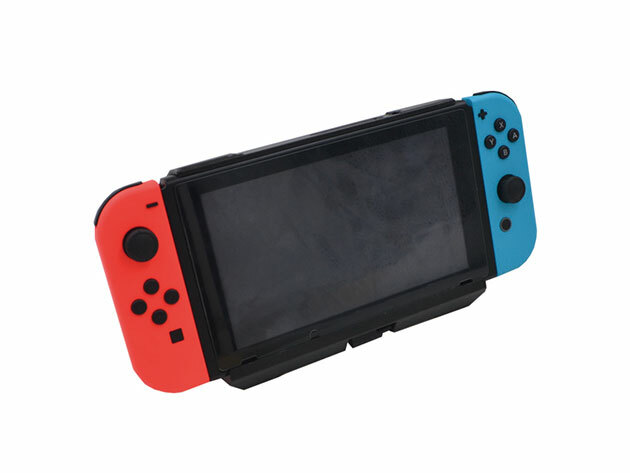 Its high-density shell ensures a slip-proof grip and shock-resistant protection, while the built-in kickstand allows for cooling airflow, preventing your Switch from overheating. Plus, the charger even boasts a Quickchip chipset to provide steady power flow while protecting against over-charging. You can pick up the Nintendo Switch Battery Charger Case on sale today for $40.